Parents with young children are fortunate to have a wide variety of opportunities to ensure that they’ve planned for a future that is truly bright. Proper planning can help parents to put their children on a path that leads to true happiness and success in both their personal and professional careers. Unfortunately, many families fail to properly plan for their children’s financial security, educational needs, and other concerns. Many others fail to even plan for tragedy that could devastate their minor children’s lives. The Litherland, Kennedy & Associates, APC, Attorneys at Law understands just how precious your children are to you, and we’re here to provide the assistance you need to ensure that their future is secure. We can help you work to ensure that your family is on a path to success, with wealth-building advice that can create opportunities for you and your young children, secure protections that safeguard their well-being if something happens to you, and achieve other important life goals. Are there things that parents with young children can do to protect their family’s future? Is there a right time to seek estate planning assistance? How can a California estate planning attorney help parents with young children? Establish a savings plan that is targeted toward milestone events in your family’s life. These goals can include things like purchasing a house, providing a college fund for your minor children, retiring early, and more. Develop an investment plan that includes 401(k) plans, individual retirement accounts, and other useful wealth-building endeavors that can help you leverage your savings into real wealth. Provide your family with asset protection to guard against litigation and other threats that could expose your personal wealth to unexpected liability. Develop a plan to deal with incapacity. You should have a power of attorney, advance directive for health care, and other important documents to ensure that someone is empowered to make financial and medical decisions for you and your spouse if incapacitation strikes. Appoint someone to serve as your children’s guardian in the event that both parents become incapacitated or die. Create a plan that ensures financial support for your minor children after you’re gone. Provide the insurance you need to guard against common and catastrophic threats. There are other things that you can do as well, and your California estate planning attorney will be able to discuss those additional protections with you. The important thing is that you get started today to ensure that your family and minor children have the protections they need to withstand even the most devastating unforeseen events. With creative and effective planning, you can provide them with the security they need to make the most of all the opportunities life can present. California law provides a host of powerful legal tools to help you protect assets, grow wealth, and protect your minor children using tools like trusts. Your attorney will be able to help you identify the best solutions for your unique needs so that you end up with the right personalized plan to accomplish your objectives. A California estate planning attorney will be happy to review your current plan and suggest necessary modifications, or create an entirely new strategy to protect your family if one doesn’t already exist. The important thing is to get the help you need early so that you are never surprised by events that happen without warning. Don’t wait for something unexpected to occur. Get the help you need to plan for your future today. Parents with young children have always been presented with an almost equal measure of opportunity and risk. The key to success for your family is to maximize that opportunity while reducing the risk as much as possible. 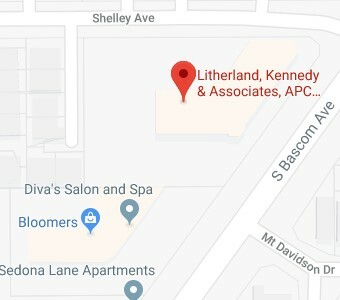 At the Litherland, Kennedy & Associates, APC, Attorneys at Law, our estate planning experts can help you to accomplish those goals to ensure that your family’s future is as secure as it can be. If you’d like to schedule your free personalized California estate planning consultation, please reach out to us using this website or call us on the phone at (408) 356-9200 in Campbell or (831) 476-2400 in Aptos.